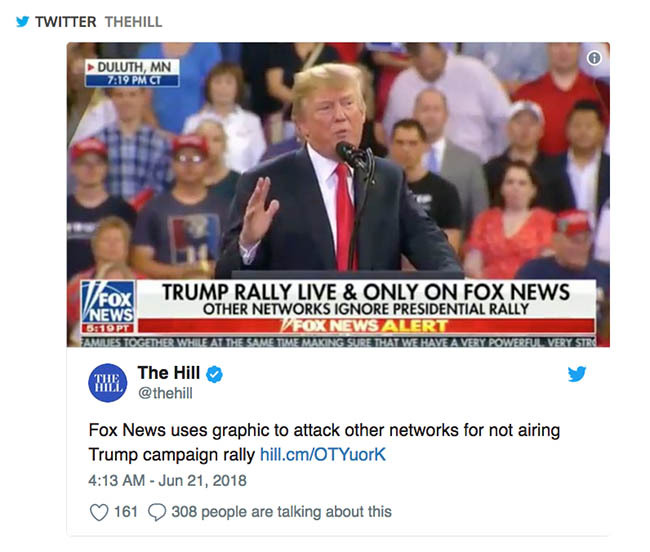 Fox News Channel aired a graphic during President Trump’s rally that called out other networks for not airing the Presidential rally. Fox News took aim at other cable news networks on Wednesday night for not airing President Trump’s campaign rally in Duluth, Minnesota. “Trump rally live & only on Fox News, other networks ignore presidential rally” the network’s chyron read during its broadcast of Trump’s rally. Fox Business also aired the rally. Both CNN and MSNBC carried on with regular programming. Trump is well-known for his avid consumption of Fox News, often tweeting about the network’s programming. He made a surprise appearance on “Fox & Friends” Friday from the White House lawn. The president was at the rally to support Republican candidate Pete Stauber, who shared the stage with the president for a short time. On what planet would all major news station not be showing a rally if it were Barack Obama? That is the difference folks and it is the bias that President Trump speaks about.